But some rules shouldn’t be broken, and ignoring them can have a bigger impact than the top of your Frosted Flakes being too dry. Take a look at these Minnesota recycling laws that keep the Earth a little healthier and our crews a little happier. It seems like a new type of TV comes on the market every day, and we don’t blame you if you pick up the newest one to replace your semi-newer one. But if you’re not selling your old TV, recycle it. 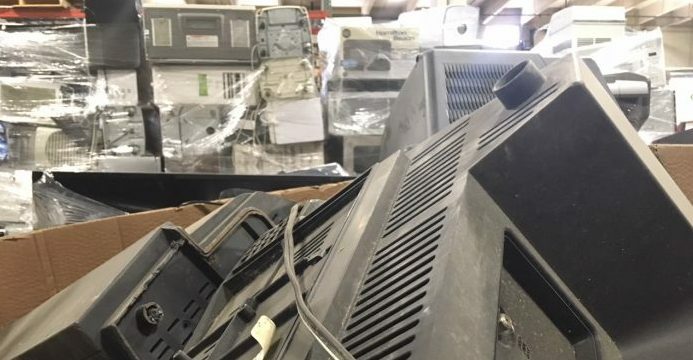 In Minnesota, throwing a TV in the trash is against the law since it’s full of toxic metals, certain types of batteries, and parts that can be recycled and reused in newer TVs. Throwing TVs in the trash is illegal. Don’t do it or we’ll tell mom. The same goes for nearly all electronics. Computers, stereos, cell phones—they all have parts that can make you sick if they end up in our air or water. We vote good-tasting faucet water. Do everyone a favor and recycle your electronics. Throwing away electronics is illegal. Don’t make us pick up the Bat Phone. Who doesn’t love a good summer bonfire? The Earth, in fact—as long as garbage is being burned. It seems like a good way to get rid of old boxes or plastic bottles, but burning things doesn’t make them disappear (unlike this guy’s adorable pigeon). When you burn anything—including firewood—it turns into heat, smoke, and ash. Some things don’t cause that much of a bother—like firewood—but other, non-organic items get our air, water, and crops all toxic. In Minnesota, you can be charged $1,000 and get sent to the slammer for 3 months for burning trash and recyclables. All to watch a Coke bottle melt? Not very worth it to us. Burning trash is illegal. Do we really need to get the Feds involved? Batteries are everywhere. You have one in your pocket, probably one on your wrist, several in your car, and too many to count in your home. We’ll make it easy: If it’s a battery, don’t throw it out. Bring them to a recycling center to be safely disposed of. Throwing out batteries is illegal. Ever been to prison? We hear it’s not great. Though this guy seems to dig it. Please bring these to a recycling center. It’d really make our day. Think you can take a few aluminum cans from your neighbor’s recycling bin? That’s a misdemeanor in Minnesota. It seems like a harmless task—you’d probably recycle the cans anyway, right? But the city of Minneapolis said it loses $135,000 each year when people steal from recycling bins. Don’t steal from recycling bins. Unless it’s your own. Luckily for you, we accept a whole slew of recyclables. You can even leave some on your curb and have us pick them up.